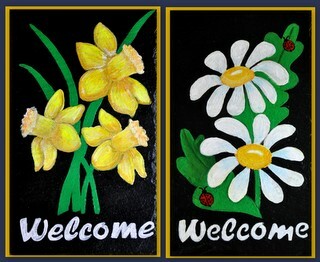 Come paint these pretty Spring flowers on slate. Add Welcome or additional flowers. Designs are transferable onto the slate so no drawing skills needed. The slate will be drilled with holes so it can be hung from the leather cord that will be supplied. Come early and have dinner. The Bowman Restaurant offers an extensive menu sure to please everyone.